"The Aquilonian host was drawn up, long serried lines of pikemen and horsemen in gleaming steel, when a giant figure in black armor emerged from the royal pavillion, and as he swung up into the saddle of the black stallion held by four squires, a roar that shook the mountains went up from the host. They shook their blades and thundered forth their acclaim of their warrior king -- knights in gold-chased armor, pikemen in mail coats and basinets, archers in their leather jerkins, with their longbows in their left hand." 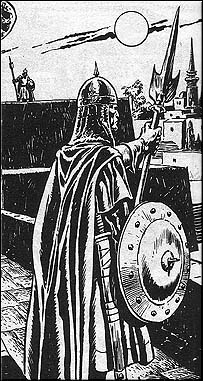 -- Robert E. Howard: "The Hour of the Dragon"
The mightiest kingdom of the west, the foremost of the Hyborian kingdoms of Conan's day, Aquilonia is a commercial and military giant with a high level of civilization. Only Nemedia, Aquilonia's rival, boasted of a richer cultural diversity. Aquilonia is, overall, a land of pleasant temperate climate. The Aquilonians are tall and varied in complexion, but all are steadfast in their devotion to Mitra. In matters of war, Aquilonia puts their trust in a heavily armed cavalry and a strong infantry. The Imperial troops are called the Black Legion, and the king's personal bodyguard are known as the Black Dragons. Tarantia, the seat of power in Aquilonia, is a center of romance, adventure, wisdom, and wit. Tarantia also houses the grim Iron Tower, a notorious prison. There is a shortage of good farmland in the interior of Aquilonia because the great lords of Aquilonia have sequestered much of the cropland for personal use (such as privileged hunting preserves), creating a never ending movement of pioneers toward the Westermarck, the frontier between Aquilonia and the Pictish Wilderness. By Conan's time, Aquilonia's royal house was in a state of decadence and the Westermarck region on the verge of revolt. Conan first came to power in the Westermarck. Subsequently, a Poitainian faction helped Conan usurp the Aquilonian throne. He ruled for some 20 turbulent years before abdicating in favor of his son, Conan II, called Conn. Years later when Aquilonia was at its zenith, it annexed Zingara, Argos, Ophir, and western Shem. Some 500 years after Conan's time, internal decay and a Pictish invasion destroyed Aquilonia.